How can social movements become more gender-just? How can donor support gender justice through social movements? 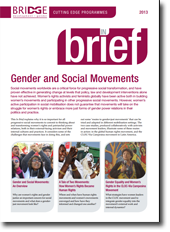 As part of the BRIDGE Cutting Edge programme on gender and social movements, we have produced two key publications. A framework for understanding social justice movements and some of the debates, challenges and tensions they face. An introduction to women's and feminist movements, their visions and strategies, and the gains they have made over recent decades. An overview of responses by broader social justice movements to issues of women's rights and gender justice. 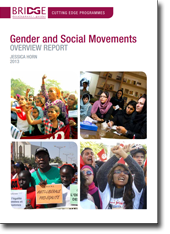 An assessment of common challenges in building gender-just movements. A description of the core elements of gender-just movements. Some practical routes for nurturing social justice movements that challenge unjust gender power relations in all domains. Download the French overview report. Download the Spanish overview report. The bulletin contains a short summary of the report, as well as two case studies featuring the CLOC-Via Campesina movement in Latin America, and the global human rights movement. Spanish and French versions of the bulletin are available on the same page.